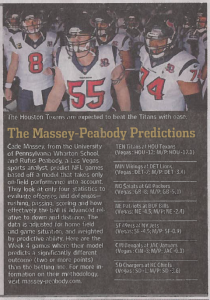 Last week the Wall Street Journal debuted our 2012 picks in their national edition, and plan to run the picks on Fridays for the rest of the season. Those picks are based on Thursday afternoon lines, while the picks we blog are based on Tuesday afternoon lines. That means peformance can vary across the two. In fact, which games are even considered picks can vary. Going forward we will track the WSJ picks separately in our weekly blogs. This week we were 4-3. This is in fact what we tweeted about our week, without realizing the games had changed and we had done better in our Tuesday picks. In one game, the line moved toward us enough that it slipped below the 2-point threshold and the newspaper dropped it, according our guidelines. That was the the Miami-Arizona game, which opened at Arizona -6 but moved to -4/4.5 by gametime. As posted on Tuesday, we had it at -3.88, so liked Miami at +6 but lost that edge altogether by the end of the week. If you got your pick in on Tuesday, that was a win. On the other hand, the line on the New England-Buffalo moved away from us and became a pick. And, as requested, the WSJ added it when it crossed our 2-point threshold. On Tuesday the line was Pats by 4. We had them by 2.4, so didn’t consider it a pick. On Thursday as the Friday edition was going into print, the Journal saw the line at 4.5 so included the Bills as a pick. This one hurts, as we lost that game, and there seems to be only one book that had the game at 4.5 – everyone else had it at 4, or even 3.5! Alas. Anyway, we’ll keep tabs separately. We often see the line move toward us so like to get our picks up and official early in the week. That said, we want to compare our performance only to legitimate, bettable lines, so we can’t post TOO early. So we try to post on Tuesdays. And to make sure we’re using bettable lines, we’re going to pick them up from Bookmaker, on sbrodds.com. So, we open at the WSJ at 4-3. Apologies for any confusion.